Astronomer Donald Liebenberg has spent more time in totality — when the moon covers the sun — than any other person on Earth. While millions of Americans experience their first total solar eclipse, Donald Liebenberg will be seeing his 27th. Liebenberg is an adjunct professor in the physics and astronomy department at Clemson University's College of Science. He holds the record for most time spent in totality — that's when the moon completely covers the sun. "The beauty is spectacular and it's awe-inspiring," Liebenberg said of witnessing a total solar eclipse. He experienced his first one in 1954 in Mellen, Wisconsin. Since then, he's traveled the globe visiting places as remote as Pukapuka, a coral atoll in the Pacific Ocean, to take in that small window of opportunity to study the sun's outer atmosphere. "I was trying to answer — or still am — the question of what is the energy mechanism that heats this corona to a million degrees? Thermo dynamically, that's not possible. Heat flows from the interior of the sun at high temperature out to the surface of the sun to 5,500 degrees. But it's more than 100 times that temperature in the solar corona and how does that happen?" Liebenberg explained. Liebenberg's quest for that answer inadvertently made him a record holder: He has spent over two and half hours in totality. A 1973 flight on a Concorde jet accounts for 74 minutes of that total. "The blue light against a very dark background, a marvelous sight," Liebenberg said. "The analysis allowed us to find several regions in the corona where this five-minute periodicity did show up. And that was very rewarding because I think it was the first time people had seen the appearance of these waves in the corona." After traveling to remote places around the world for decades, it seems only fitting that for his 27th total solar eclipse, Liebenberg will only need to step out onto his driveway to view it. "This is just a magnificent and unusual feature in the heavens, and it provides an opportunity for people to experience this feeling of being overtaken by the shadow and having a view of this splendid corona," Liebenberg said. Millions of people do plan to experience the eclipse, but some are having a hard time finding the glasses or hand-held viewers needed to protect their eyes from ultraviolet and infrared light. Eye protection has been hard to come by because once glasses and viewers are stocked, they fly off the shelves. And not all are created equal. Some don't actually protect the eye, so if you're in the market for them, check out the American Astronomical Society. It created a webpage with a list of where to buy reputable glasses and viewers. If you're in the path of totality, you can remove the glasses or viewers once the moon is completely covering the sun. But if you're not, you need to keep your eyes covered for the entire time. 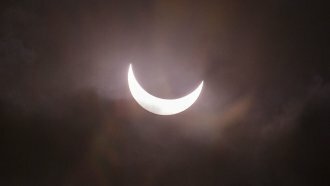 If you can't get your hands on glasses or viewers, astronomer Rick Fienberg has some suggestions. "Look on the ground and see sunlight dappling through the little holes through the leaves and the little dapples of sunlight will be crescents during the partial eclipse. If you don't have any trees around and you still want to do that, grab a spaghetti colander, look at its shadow on the ground, all the little holes on the bottom of the colander will project little images of the crescent sun on the ground in the same pattern as the holes in the colander. And if you don't have anything, no trees, no colander, just do this [put your hands over each other at an angle to create a grid] with your fingers and put the sun at your back and look at the shadow of your fingers at the ground and you'll see the little crescent suns projected from the space between your fingers," Fienberg, who is also the press officer for the American Astronomical Society, told Newsy.